A common analytical method in pricing is Conjoint Analysis. While this has evolved into far more sophisticated methods, at its core Conjoint Analysis is about finding how much utility different customers assign to different “features/aspects” of a product. If you know the utilities you can find how to price different product versions. Here is a quick tutorial if you want to know more. In the case of tablets you can think of iPad and Fire to be a collection of features (or benefits) that customers assign perceived utilities. So when you add up the utility assignment for each feature you get the total utility. 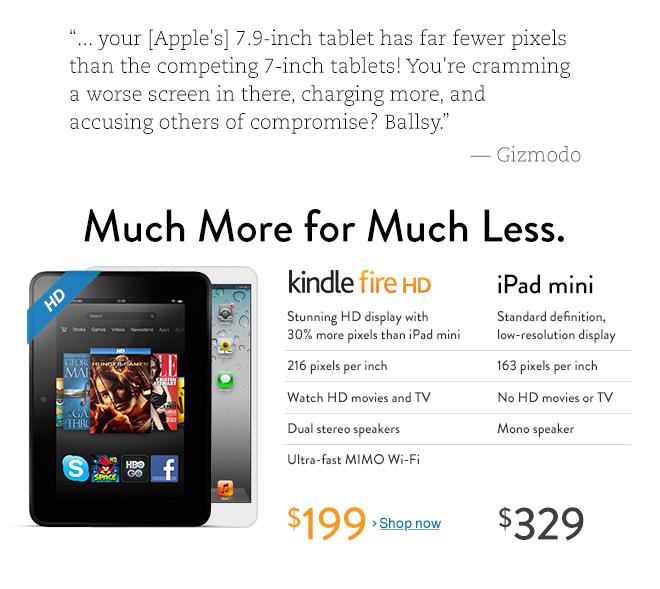 A few days ago Amazon ran a message on its main page comparing Kindle Fire and iPad mini, feature by feature. The message essentially says Kindle Fire at $199 price point offers better features (by extension better utility) than iPad mini at $329 price point. Likely true. But the point to note is the utility value from features is neither absolute nor intrinsic. It is perceived utility and it differs from segment to segment. Furthermore there are the “Fudge Factor” – the unknowns, Brand premium and Ecosystem Premium. Apple likely found a sizeable segment – different from Amazon’s target segment – that assigns lot more value to Apple’s Brand and Ecosystem than they do for Amazon’s Brand and Ecosystem and hence is willing to pay $130 more for iPad mini. (Technically it is $95 more if you consider Fire without “Special Offers” and add price of Fire charger). Amazon’s comparison is valid. But if the customer segments and their value allocation is not the same, then it does not matter that Fire packs better features at lower price. That is likely why Amazon decided to pull the Ad? I can’t tell you when this will happen. But it will happen. Mark my words: The Kindle will be free. First, why? Well, that’s easy—because Amazon’s long-term goal is to make money from selling content and general merchandise, not by peddling its own devices. The case in point is the low-end $79 Kindle that will be free. So what kind of money should Amazon make by selling content and general merchandise by not peddling its device? Let us be aggressive and assume that this low-end Kindle is going to be great to sell general merchandise and not just content. Again according to Manjoo, Amazon makes no profit on these devices or may be even losing money. Let us say they are indeed selling $79 Kindles at their marginal cost. Say by making the Kindle free, they sell 20 million of them. Cost? $1.58B for 20 million units. Just to stay where there are with current gross margin, they have to gain gross margin(not sales) of $1.58B from content and merchandise sales. To put that in perspective, Amazon’s 2011 gross margin is $10.8B from sales of $48B. At its 22.4% gross margin, this $1.58B means $7B in sales. And this $7B sales will all have to be incremental new sales, sales that are made possible only because of the free Kindles. Sales that would have any way happened, because customers do shop even without free Kindle, cannot be counted towards these numbers. On a per Kindle basis that means every free Kindle user must spend additional $350, above and beyond what they are already spending with Amazon. How likely is that scenario? Say amazon now has 100 million shoppers, its current revenue of $47B means, each shopper spends an average of $470 per year. Can a free kindle somehow add $175 per year (assuming device lifetime of 2 years) to this $470? Now this is just the simplest of the math. You can see how unfavorable it gets when you add in lost profit from those who buy other Kindle models and Kindle Fire switching to free version. On the flip side, say if Amazon were able to sell 5 million of the $79 Kindles. As per our marginal cost assumption they are no costs. If Amazon were able to generate the same $175/y in incremental sales from these 5 million customers that is $875 million in new sales and $196 million in new profit – not just the profit they had to make stay at same place but something that actually moves the needle. Why wouldn’t they do that? If somehow a free Kindle buyer could be coaxed to spend $350 more why is not possible with the one that bought Kindle for $79? I don’t have the window into Amazon’s strategic mind or the data they are looking at.May be you should ask Manjoo. Amazon has said before, “economics don’t work for a free Kindle”. That appears as a bluff to Manjoo. What appears like a bluff to us outsiders may really be the result of strategy guys doing their job – evaluating all possible paths ahead of them and making choices with constraints. That is the difference between writing something based on one’s wishful thinking and having to make decisions that affects shareholder value. Food Truck Race is a reality TV series on Food Network where contestants compete by selling food from their food trucks. Compared to other cooking contests, this series has very objective metrics- final sales dollars they are left with that decide who gets eliminated each week. Contestants get seed money to buy first batch of raw materials but have to use part of revenue to buy more for producing more. You can see why just maximizing revenue is not the winning strategy but maximizing profit is. So they choose different products and pricing to maximize profits, mostly choosing premium products at premium prices. While the contestants generally have freedom in designing their menus and setting prices, in one of the episodes they were told they had to price everything below a dollar. That is someone else just set the price for them. That is it. No branding, no positioning or no product versioning. In summary these became the price takers to an external entity. There are two kinds of businesses – those who take active control of their pricing and get to set their own prices and those who react to price set by others, be it an Food Network TV show host or another player in the market. Food Trucks competing with price limit may sound unrealistic but that is exactly what is happening in the low end tablet space. There is one price setter, Amazon with its Kindle Fire that set the $199 price point. As Henry Ford wrote in his autobiography, Amazon chose the price first and did everything to deliver a product at that price. While Ford added the importance of making a profit on the sale Amazon is focused on other ways to drive profit like making incremental sales through the device. But the fact remains, Amazon is the price setter in this space. Anyone else entering the mini tablet market are forced to take the price set by Amazon, like the Food Truck Race contestants did. Even the mighty Google that practices perfect pricing with its AdWords network saw itself in the role of price taker. The fact that it is a superior product to Kindle Fire did not matter in setting its price. That is correct, with Amazon as price setter, Google was reduced to the role of price taker, forced to rethink their strategy and in that process abandoning any plan they might have had for different pricing. In the TV show it was impossible to go against the set price and in real life it is almost impossible unless one can change the target segment, reference and product positioning. By targeting the same segment with same value proposition and positioning Nexus 7 in the same way Amazon positions Kindle Fire, Google is forced to take Amazon’s price. Life is not fun being a price taker! Finally, what about Apple and its much rumored iPad mini designed to compete in the 7″ tablet space created by Amazon and now expanded by Google? Entering this segment would mean becoming the price taker or making an effort to become a price setter with a different price point. By design, Apple has never been a price taker. In any market, the price setter gets to control its own profit while a price taker is at the mercy of market forces. Trying to become a price setter when there already is one requires Apple to either go low or just a bit higher. Either way, Amazon has set the price anchoring. The most likely scenario is a $299 price point for the iPad Mini. For a business that actively takes control of its pricing it is highly unlikely they would give up that control for a new device. Revisit the three steps I listed for price takers. Apple already sells millions of premium price iPad at low enough cost and unbundles almost everything. How much more volume should they get and how much more costs can they cut to make profit from iPad mini? If Apple indeed introduce iPad mini, expect them to position it much different from how Fire and Nexus 7 are positioned and hence become price setter for this category. How is iPad2 sales doing? Previously I wrote about the popularity of $399 iPad2. In the second quarter, during the one month Apple had $399 iPad2, they sold 2 million units of this discounted version while the total number of units dropped to 11.8 million. The cheaper iPad2 accounted for 18% of the total iPads. This is the first full quarter of New iPad and $399 iPad sold side by side. How did Apple do in their numbers? Apple sold 17 million iPads, 5.2 million more than last quarter. But they do not break down the splits. Following the math I showed before, we can find decent approximations of these numbers. What can we say about these numbers? The sales growth (units) is almost evenly split between iPad2 and New iPad. The new-ness and popularity of iPad2 likely contributed to the additional 2.7 million units. The old $399 iPad2 seems wildly popular. Apple sold additional 2.5 million units for a total of 4.6 million iPad2. How many of these 4.6 million are the trade-downs, those who would have bought new iPad had the $399 iPad2 not been there? How many are truly incremental sales, those who would not have bought New iPad but were attracted by the value of $399 iPad2? So a net gain of $225 million from keeping iPad2 around. Not bad. 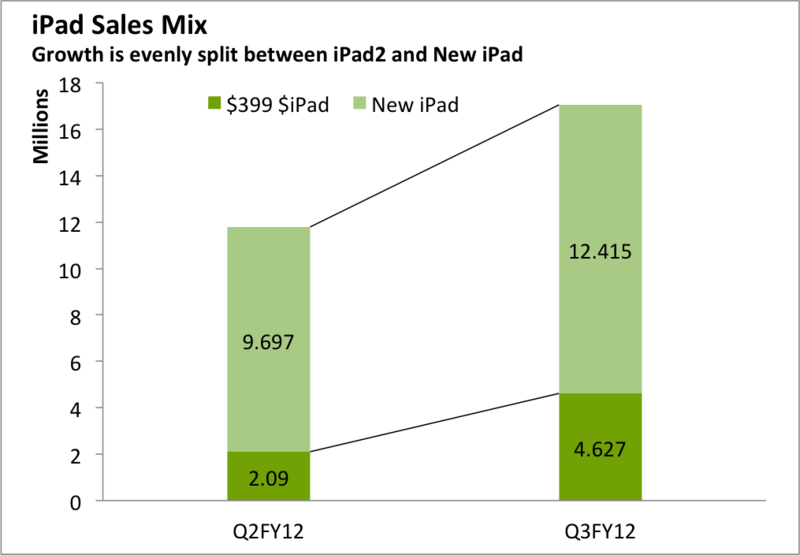 But this quarter could be an anomaly because many of those who bought original iPad two years ago upgraded to new iPad. How many Kindle Fire sales were lost because of the $399 iPad2? Unfortunately I do not have data yet because Amazon does not even release its aggregate Kindle numbers.